A 20-year-old college student finished her summer classes only to be excited for the semester which lies ahead. Little did she know that her life was to take a turn for the worst. Instead of college corridors she’d be facing the dreadful halls of hospital buildings, instead of friends she’d have nurses, instead of professors she’d have doctors and instead of locking a college dorm door, she’d eventually be locked away in a coffin box. This is Nancy’s story. This is my little sister’s story. 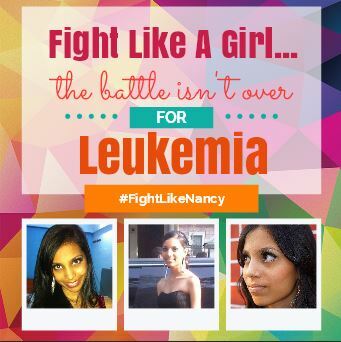 Nancy Parmar was diagnosed with Acute Myeloid Leukemia (AML) with a FLT3, a form of blood cancer, the summer before her junior year at CUNY Brooklyn College. An aspiring dentist, she worked long hours in preparation for her Dental Admissions Exam all summer long only to find out that she would not be returning to school for quite some time. Trapped in one hospital room after another, Nancy showed no signs of improvements. After numerous aggressive chemotherapy treatments, she was left with only one choice – clinical trial drugs. After days of researching various drugs, my family and I found one which we sought best. Luckily, the drug worked and Nancy was in remission. The journey which began on July 26th, 2013 ended with her allogenic stem cell transplant on November 14th, 2013. Nancy was given a mix of cord blood stem cells due to the lack of a single match donor. We were aware that this treatment would not be able to hold her off for too long as it was not from a single perfect match donor but we had our hopes set high. Unfortunately, the transplant failed and she relapsed months later on April 29th, 2014. We started her off with another clinical trial but the treatment failed causing her to breathe her final breath on July 28th, 2014. It is true what they say, “You don’t know what it feels like until it happens to you”. Truth is, a cancer cell regenerates in your body every 72 hours, if you are strong enough to fight it off at the moment it occurs, you are lucky; if not, you become a mere statistic. According to the institute for justice, “Leukemia will strike 44,000 Americans, including 3,500 children. On a more international level, about 3 out of 4 leukemias among children and adolescents are acute lymphocytic leukemia (ALL), acute myelogenous leukemia (AML) and acute myeloid leukemia (AML).” Tracking back to our roots, developing countries including India see a rise in number of cancer patients. A country once known for its valleys of gold, majestic architecture and vibrant colors is now known for cancer trains and mortality rates. The city of Mumbai alone has 44,000 deaths resulting from leukemia annually. In a country of 1.2 billion people, it is a shame that 44,000 have to lose their lives because of lack of donors. The lack of donors haunts all those afflicted with the disease just as it haunted Nancy. Despite having lost her battle to cancer, Nancy is not a statistic. Numerous drives were conducted by friends and family via Delete Blood Cancer – DKMS in collaboration with Checkmate, Cancer and Be The Match Registry’s subgroup SAMAR. These drives successfully recruited over 1200 college students from the East Coast to be bone marrow donors in Nancy’s name. That is a possible 1200 lives saved! In addition to this, college students and their families were informed of the dangers of pediatric blood cancers and the lifesaving treatment. October 29th was officially declared Saving Nancy Recognition Day by the honorable Marty Markowitz, President of the Borough of Brooklyn. On this day, each year students of Brooklyn College intend on hosting a bone marrow drive in her name. She left behind a legacy, one which I intend on continuing. For Nancy and those like her, a few white blood cells, blood and platelets can make all the difference. September is the designated month for blood cancer and pediatric cancer awareness. This September, I urge you to donate blood, platelets, become a bone marrow donor and raise awareness in your community. Help save innocent lives today!